Graduated distilling receiver with a standard taper outer joint on top and a standard taper lower drip joint. Stopcocks are either a 2mm or 4mm PTFE. 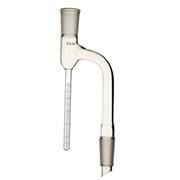 Distance between the receiver and the uptake arm: 10 and 20mL are 100mm center to center; the 50, 100 and 250mL are 150mm center to center. 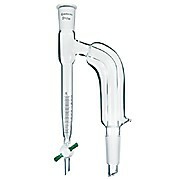 ,p>Especially designed receiver to draw samples during distillation or to return the condensed vapor to the flask. Capacity 125ml, available with or without 1:5 PTFE plug. An excellent all-purpose receiver for general distillation work. Equipped with a complete stopcock manifold to allow contents of the receiver to be removed to a single receiving flask without disturbing the vacuum of the system. Stopcocks are 4 mm bore.Tubing connections are 10mm O.D. olive type. 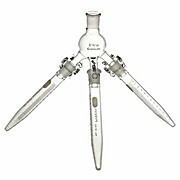 Distillation apparatus for obtaining separate fractions while maintaining constant pressure. 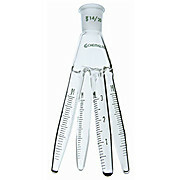 Code -10 complete unit features ground joints and four 9458-02 5ml flasks. 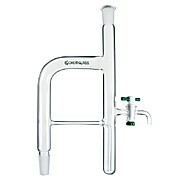 Code -25 complete unit features PTFE clad joints and four 9458-02 5ml flasks. Similar to CG-1279 but with the top outer joint vertical instead of a 105° angle. Complete item consists of a vacuum adapter, distribution adapter, four of the listed size flasks with hooks and ten CG-110 stainless steel springs. For operation other than at atmospheric pressure. Vacuum is applied to the side arm with the T-bore stopcock. The secondary receiver is vented by means of the lower stopcock. 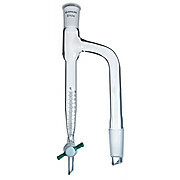 The capacity from the bottom of the drip to the stopcock is 2.5mL. Calibrated to contain. 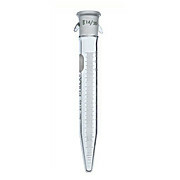 Supplied in 10mL capacity with 0.2mL subdivisions. Centrifugal type, calibrated to contain. Graduated in 0.1mL subdivisions. Total capacity 15mL. 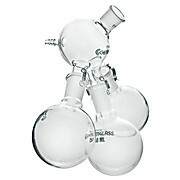 The three 25mL flasks are in the same plane, rotated about the condenser axis. Hose connection is parallel to and above condenser axis. 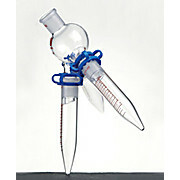 Three clips are supplied for holding flasks to condenser. All joints are 14/20. Hose connection is size A. With the outer and inner joint at 135° angle, used with short-path. 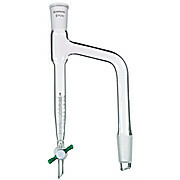 Centrifuge tube shaped receiver with an upper standard taper joint has two glass hooks 180º apart. Graduated from 0 to 2mL in 0.1mL subdivisions and from 2 to 12 or 15mL in 0.2mL. 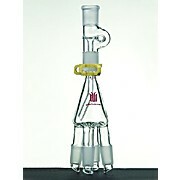 Graduated distillation receiver with a 4mm three way stopcock to permit solvent removal through the 10mm O.D. 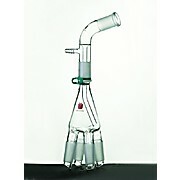 tube or return to distillation flask. Upper sampling port has a 2mm PTFE stopcock. The top outer and lower inner joints are the same size. 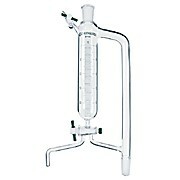 All-purpose receiver for general distillation work. With graduated body. Stopcocks are 4mm bore. Tubing connections are 10mm O.D. olive type. Jacketed receiver with vacuum manifold for removal of sample during operation without disturbing the system. Stopcocks on manifold are 4mm bore, receiver stopcock is 3mm. Hose connections are size E on condenser; 10mm O.D. olive on manifold. 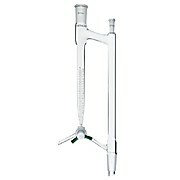 Cow type reciever has a single standard taper outer joint at the top. 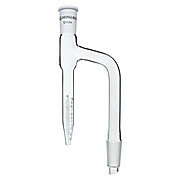 The four lower graduated receiver tubes can be accessed via a syringe for product recovery. Tubes are graduated from 0 to 3mL in 0.2mL subdivisions. With standard taper inner joint at bottom and outer joint at top. Graduated to 125mL in 1mL subdivisions. With standard taper joint at top. Capacity 100mL, in 1mL subdivisions. For easy separation of water from reaction or distillation system. 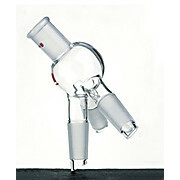 Supplied with distribution adapter, three 12mL receiver tubes and three plastic joint clip. With 135° angle between top outer joint and lower inner joint. Barrett style distilling receiver used to determine the water content in petroleum or bituminous material. Receiver is made according to ASTM specifications, with the addition of the top outer standard taper joint and lower stopcock. Available with glass or PTFE stopcocks. 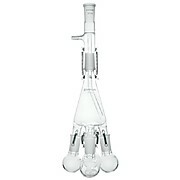 Similar to CG-1261 but with the uptake tube vacuum jacketed to improve distillation performance. The jacket eliminates the possibility of condensation or recrystallization of distillate in the sidearm. 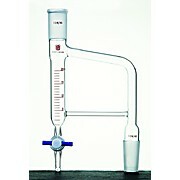 Dean-Stark receiver used for determining the water content of various materials. Can be used with ASTM Method D-95 along with similar ASTM methods.